Excellent service as always . Good new location at Gatwick. With almost four decades of experience providing the ultimate service at Gatwick, APH parking is taking its award-winning service to even higher levels of excellence with an all-new state-of-the-art car park just minutes from the airport's two terminals. Located just seconds from the M23 motorway, APH parking has never been easier or safer. Bringing the best in legitimate and secure service, APH parking Gatwick is ideal for all types of travellers whatever their requirements. Arriving at the brand-new barrier-controlled APH Gatwick car park, drivers will be greeted by friendly uniformed staff, a fully metalled surface and the very latest in high-tech security technology. 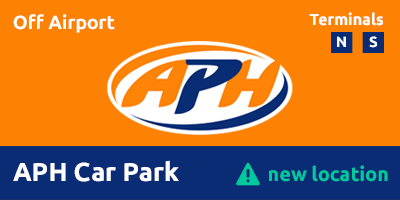 Getting the airport is faster with the all-new APH park and ride service! Travellers now enjoy dedicated shuttle buses carrying them straight to the doors of either the North or South Terminal – cutting the transfer time to just ten minutes for the South Terminal and 12 to the North Terminal. Buses run every 15 minutes throughout the day and night, ensuring passengers are always less than 30 minutes from the terminal doors whatever time they arrive for their APH car parking. While passengers are making their way to the chosen terminal, fully qualified APH car parking staff will inspect their cars and move them to a safe and secure parking space within the security-protected APH airport parking facility. Customers won't need to fret over the well-being of vehicles in their absence, with the all-new APH Car Park Gatwick, locking-down the site with complete CCTV coverage, barrier-controlled entry and exit, high-tech sensors, security fencing and APH Gatwick staff on the site 24 hours a day, 365 days a year. This is the car park that never sleeps – or takes its eye off your car! Along with a new state-of-the-art car park bringing high-tech security advances, customers will be reassured to hear that APH Gatwick Car Park has been granted an all-new Park Mark Safer Parking Award. We're sure many of our loyal customers will have great memories of the friendly welcome and helpful service they received at our old home, but we're happy to reassure them that despite our move to new and improved facilities, our dedication to providing the very best in service has most definitely made the move with us! Spring Offer - selected dates and times only. This is a flexible product, you can amend or cancel up to 24 hour prior to departure date. APH Gatwick park and ride customers benefit from dedicated transfers straight to their departure terminal. Shuttles run every 15 minutes and take around 10 minutes to the South Terminal and 12 minutes to reach the North Terminal. Returns from the North and South Terminal to the APH parking facility run at similar intervals and also operate as dedicated services, helping to cut the time it takes to collect cars and continue onward journeys. Full details of the easy-to-find collection points will be issued prior to departure. APH airport parking has always worked tirelessly to offer the very best of secure parking at Gatwick Airport. However, the all-new car park takes security to a higher level than ever before, affording travellers the complete confidence their vehicle is safe, secure and being watched over at all times. With the latest computer-controlled digital CCTV covering the entire site, barrier-controlled entry and exit systems and full floodlighting over the entire site, the APH car parking team can care for vehicles throughout the day and night – 365 days a year. When it comes to security, APH has no blind-spots. Where will my car be parked at APH Gatwick? Travellers using APH can expect complete transparency when it comes to knowing where their car will be parked while they’re away. Our new car park has expanded capacity, meaning your car is most likely to remain on the site for the duration of your trip. However, there is a chance that at times of unusually high demand, that your vehicle could be moved to our alternative site. These sites are the previous APH main car park, which has been retained with the full security protection enjoyed before our move to the new site. Additionally, we operate a second secure overflow car park known as Westlands, where your vehicle will be parked on a hard-standing, protected by full CCTV, security fencing and motion-detection alarms. Your vehicle will always be returned to the all-new Gatwick APH main car park for collection. Where will my car be parked at APH Gatwick? When booking our APH Gatwick Park & Ride option, you can be assured that your car will be fully secured in a car park that has been awarded the Park Mark Safer Parking Award. Our new state-of-the-art APH Car Park, just off the M23, is a fabulous new site, with easy access to both terminals at Gatwick. This is where you will drop off and pick up your car. And this is where your car will normally stay for the duration of your trip. In peak travel times, however, APH offers expanded capacity to meet demand. This means that we could move your car to the former APH main car park at Snow Hill (overflow1) or to our alternative secure parking option (overflow 2), at Westlands. Either option will incur less than seven miles additional mileage. They are protected by full CCTV, security fencing, motion-detection alarms, and are approved with the Park Mark Safer Parking Award. Your car will always be returned to the main APH Car Park ready for you to collect. Our buses have with wheelchair facilities and staff are happy to help with any carrying of luggage. If you require assistance, press the assistance button at the barrier and a member of the customer service team will be happy to help. Maximum vehicle height: 2.4m. Trailers are not accepted. APH are unable to transport bikes, surf/windsurfing boards or items of a similar size on their transfer coaches. Snowboards/skis are acceptable. Head straight over the first roundabout (2nd exit). Continue on the A2220 following signs to APH Parking Centre. Drive through the automated barrier and follow road markings to the arrival bays. A fully trained valet driver will then park your car as you check-in at reception. Upon arrival, head for the dedicated bus stop right outside the terminal and take the bus to the APH car park. Collect your keys and pick up your car.